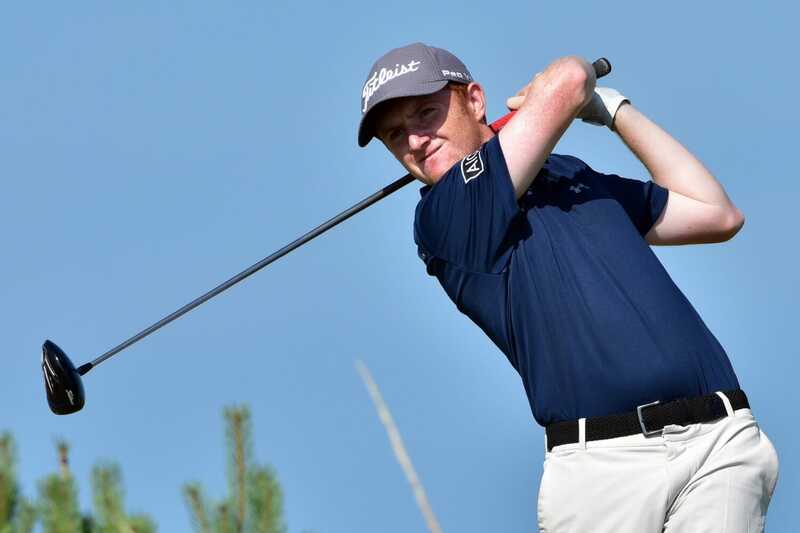 Galway’s Ronan Mullarney carded a superb second round of 67 to lead qualifying at the AIG Irish Amateur Close in The European Club. Mullarney now faces Keith Murphy (Dun Laoghaire) in the knockout stages after the cut fell at plus 12. A playoff was required to determine the final four places in the match play draw with nine players finishing in a tie for 61st. Murphy came through that playoff along with Owen Crooks (Bushfoot), Peter Kerr (Royal Portrush) and Thomas Neenan (Lahinch). Conditions were not as kind as the opening day with stronger winds buffeting the players around the Co Wicklow links but they were not forbidding either, and Mullarney shone brightest in the warm sunshine, surpassing first round leader Peter O’Keeffe by posting 67. Four birdies in his last six holes pushed Mullarney ahead of Portmarnock’s Conor Purcell in the race for silver medal honours yet he never lost sight of the main objective. His cautious approach paid dividends. How then did then he put together such a low score? The 22-year-old Galwegian birdied his opening hole but turned in level par following a bogey at the eighth. He had to wait until the 13th to notch his second birdie of the round and that sparked a late burst with three more gains over the closing stretch. At the penultimate hole Mullarney rode his luck but his powers of recovery are such that he was able profit from a kind break. With qualifying out of the way the focus switches to the first round of match play. After back-to-back rounds of 70, Conor Purcell is keen to maintain his attacking strategy. Purcell, 21, got off to a flying start in round two. He holed a 15-footer for birdie at the first and landed an eagle at the third when his 6-iron approach finished eight feet from the cup. His charge faltered when he bogeyed eight. Purcell picked up shots at 14 and 15 before relinquishing one at 16 where he took an unplayable when his ball landed in a bush. With the first hurdle cleared, Purcell is that bit closer to the title. First up for Purcell in Monday’s opening round of match play is Thomas Neenan, another of the qualifiers from the playoff. Belvoir Park’s Marc Norton plays Peter Kerr in an intriguing all-Ulster round one clash. Norton added a 74 to his opening 68 to qualify comfortably, tied third on level par. “To be level par after two rounds, I probably would have laughed at you if you had given me that at the start because it’s a very tough course,” said the 21-year-old from Belvoir Park. Norton reached the semi-finals last year and this year’s tournament is his last event in Ireland before he begins his final year at Oakland University. “It would be nice to sign off with a win here but there’s a long way to go yet.,” said Norton, who has struck form again after a frustrating spell at the start of the summer. To have hands on the trophy would be sweeter still. Two rounds down, three days to go, now only 64 players remain in the hunt for the last major of the season.